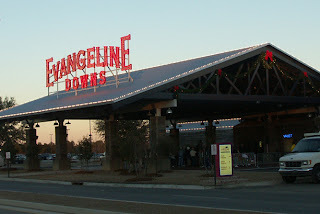 With no handicapping contests on the docket until late May, I have been dabbling with Pick 4 plays on the occasional free evening, specifically from -- of all places -- little-known Evangeline Downs. (Yes, a Carlos Marquez rides there, but not the one from Monmouth Park). My process has proven penny-wise, pound foolish, as I have missed out on some robust scores by limiting myself to tickets $12 or less, but I have at least enjoyed the agony and recognize I'm halfway decent at identifying longer prices. Call me a masochist. The experience has been largely enjoyable but financially frustrating, focusing on the late Pick 4s from this Louisiana "racino." The deep fields (often 14 horses), robust payouts and inexpensive 50-cent plays are right in my wheelhouse, but I am teetering on the brink having hit 3-of-4 in my last three efforts, two of which I was beaten at the wire and one of which (where I got knocked out in the third leg) paid over $2,000 on a 50-cent base wager! The mishap tonight occurred when my horse, Tigeresque, lost a stretch duel in the nightcap to 8-to-5 Carolyns Kitten (with a 2% winning jockey on 88 mounts in 2011), so I missed out on a probable $216 payout on my $12 ticket (3x4x1x2). The most difficult pill to swallow is that none of the winning horses in the Pick 4 on Wednesday evening paid out more than $8.40 to win (winners, in order, paid $8.40, $8.40, $4 and $5.60, suggesting that whomever makes the morning line has no clue)! The winners were posted at respective lines of 30-to-1, 8-to-1, 5-to-2 and 15-to-1. In the end, winning Pick 4 players scored a robust $425.55 for a 50-cent ticket on what proved to be four pretty chalky horses! Not too shabby...and I can't complain, considering the horse that beat me was one that I threw out, so it's not one that I considered but was too cheap to add to my ticket. Anyway, I hope to be able to hit one of these in the weeks to come, but if nothing else, I am learning how difficult and humbling it can be as a hobbyist handicapper. In the meantime, I would encourage others to at least look into Evangeline, considering the depth of fields and lucrative Pick 3 and 4 payouts. I know I have been having a blast with Evangeline's late Pick 4, though my blood pressure might disagree.